For some reason I remember the day depicted here fairly clearly. It was handing in day for the Royal Academy Summer Exhibition a couple of years ago (Another unsuccessful attempt at fame and fortune!) I was returning from said drop off, and on a mission for the wife! I was hunting out a display of hats from a Luton born milliner in the Debenhams Oxford Street, London branch. As head curator lady at Luton Museums, I believe the mission was to purchase one of these hats for the museum’s collection as long as the price did not exceed £50. Unfortunately the hat display would not begin for another week, so I took solace in a cup of tea in the Debenhams in-store café. It was here I was faced with a scene of shopping bags, coats and a variety of animated people. I rushed to get my phone out to get some clandestine photos. Not much time but I managed to get a few shots. I don’t think its always the best practise to base a painting on just a couple or three reference shots but I was so inspired by the patterns and composition in front of me that I felt I had to grab the moment. I didn’t really alter too much from the chosen photo- straightened a few verticals, and removed a fire exit running man sign (we let them burn in Andrew’s paintings world). Ultimately I also simplified the window blinds – if that’s what they were. Not sure what I think about it just yet. I feel it’s a very graphical subject and perhaps I should have lost some of the realism and flattened and brightened it up. But hey! This is what came out and I stand by it. Maybe another picture based on this one could explore these ideas at a later date. The title evolved throughout the process. 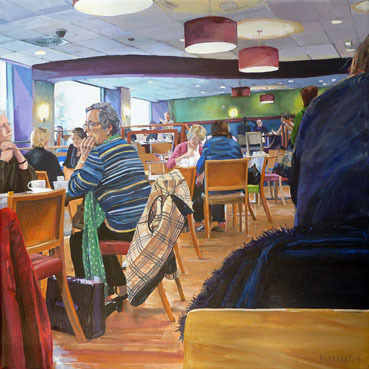 Could have been called “Debenhams café” or the like, but I quite like the idea of a sister piece for “Dreaming of Tomorrow”, another picture that gained its title near its completion. Next in the trilogy “Dreaming of a week last Friday” or maybe not!